Amber teething necklaces – is your child at risk? It is a common conundrum for parents all around the world – what is the best method to help soothe my baby? While there are many ways and means out there which are both safe and effective, from gentle rocking to a tuneful lullaby, RoSPA has noticed a worrying new trend emerging among parents who are opting to use amber bead teething necklaces. An example of an amber teething necklace. These eye-catching beads are made from natural Baltic amber and are placed around a baby’s neck to help soothe the pain of teething. While there is evidence to show that these beads can have an analgesic effect, there are some very serious hazards associated with the product which we wish to make parents aware of. 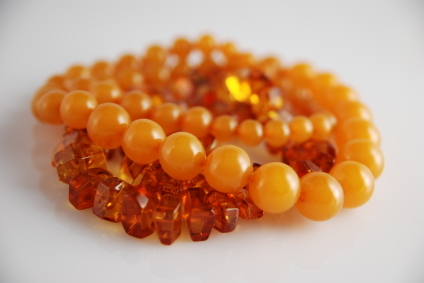 Baltic amber contains between three and eight per cent succinic acid. Those that subscribe to this method of soothing argue that the acid, which has been shown to stimulate neural system recovery and bolster the immune system, is released from the beads and into the baby. The succinc acid is said to have an analgesic effect, reducing the pain of teething. While RoSPA is not in a position to comment on the accuracy of these claims, in the past concerns have been raised about amber teething necklaces representing a choking hazard. The main concern relates to the beads and clasps which can become detached. There are also inherent strangulation hazards associated with having any type of cord placed around a child’s neck, especially babies. Some proponents have argued that the risk of strangulation is mitigated by only allowing the baby to wear the necklace when he/she is awake and under supervision. RoSPA does not support his view. Aside from the fact that babies spend a substantive part of their time sleeping, RoSPA does not advocate any cord being placed around any baby’s neck at any time. Our ongoing work on the risks posed by blind cords highlights the terrible tragedies of infant strangulation and the speed at which it can happen. Amber teething necklaces are placed around a baby’s neck to help soothe the pain of teething – but it could pose a choking hazard. RoSPA is fully aware of the stress parents can be under when their babies start teething, but there are many other options out there to help soothe teething pain, such as the use of medically approved creams applied directly to the gums. Other methods include teethers and teething toys which are often filled with a liquid and are sometimes kept refrigerated before being given to a baby to chew on. In all cases, RoSPA advises parents to seek advice from health workers (even before the baby is born) on the best and safest ways of soothing teething pain. There have been cases of amber teething necklaces being taken off the UK and European market some years ago due to choking hazards. In RoSPA’s view, the biggest problem is that these necklaces are widely available on the internet, but the fact that these products are being offered for sale and delivery to your home does not mean that they are safe for your baby. If consumers have concerns about any products they have seen advertised, contact Citizens Advice consumer helpline, on 08454 04 05 06.